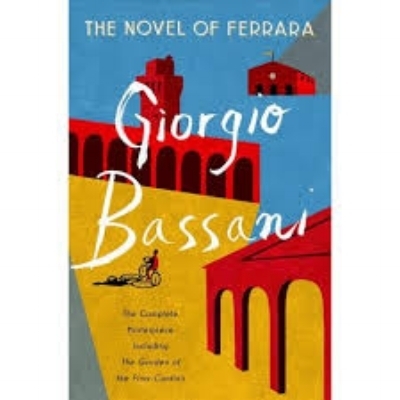 Next month, Penguin Classics (UK) and W.W. Norton (US) will release Italian writer Giorgio Bassani’s formidable work The Novel of Ferrara, which includes four novels and two short story collections. Bassani’s narratives center on the town of Ferrara, Italy largely in the years leading up to the Second World War—though also during and after the war—and particularly on the experience of Ferrara’s Jewish community, to which Bassani belonged in his youth. Perhaps the best known of his fictional works, The Garden of the Finzi-Continis, is among other things a complex love story that unfolds as the characters’ lives come under pressure due to the passing of Italy’s Racial Laws in 1938. Poet Jamie McKendrick, whose recognition and awards include the prestigious Forward Prize for best collection, translated all six individual books that constitute The Novel of Ferrara. He corresponded with Boston-based writer Stacy Mattingly to give us the story behind the translation. This exchange was conducted by email and has been edited for clarity. OA: You’ve been translating Giorgio Bassani’s work for many years. Penguin Classics in the UK released, in your translation, The Garden of the Finzi-Continis in 2007 and, subsequently, five other of Bassani’s books, which you also translated. The Novel of Ferrara is comprised of all six. What initially drew you to Bassani’s work as a reader and a translator, and what has kept you invested in it all these years? JM: I’d long admired The Gold-Rimmed Spectacles and one day rang the former editor at Penguin, Adam Freudenheim, and suggested he re-issue it in Isabel Quigley’s long out-of-print translation, and cheekily offered to write an introduction. As it happened, they were currently thinking of commissioning a retranslation of The Garden of the Finzi-Continis and he asked if I’d consider it. After looking again at the original and the two translations, by Quigley and William Weaver, I finally decided to take it on, along with The Gold-Rimmed Spectacles to follow. Once they were completed, Penguin offered for the other four books. Again I hesitated. The generally high quality of the other translations contributed to my uncertainty, but against that I heard other tones and qualities in the writing that I felt I could make more audible, and another determining factor was that Bassani had since extensively revised the entire work, in part to bring all six books together, and had also added another story and the important concluding memoir and essay. There’s also a strange phenomenon many people have noted, and the motive for retranslating any work, and that is that the translation dates while the original doesn’t. I can only account for this by assuming the original writer tends to be superior to his or her translators. I have worked on the six books slowly, for something like ten years, though that’s been intermittent—I’ve translated three other works in the meantime as well as written my own poems—but all considered it’s been a privilege and my admiration for Bassani’s work has only increased over the years. OA: What did you experience on your journey through Bassani’s work that you find particularly notable or transformative in your own life and writing? JM: Sometimes it felt more like a stretch in jail than a journey. Well, there are worse jobs, but it’s arduous work translating. For me the first draft is not a joyous process, though in this case it was lit up by the sheer dazzle and depth of Bassani’s writing. It’s only in the redrafting that I find the pleasure principle kicks in. It’s hard to say what effect it’s had on my life apart from the physical unhealthiness of sedentary years and too many cigarettes, but the privilege of attending to something so unquestionably worthwhile, I’d like to think, might bring some spiritual rewards. It’s not like it’s made me feel confident I could write my own stories or novels, but it’s certainly increased my respect for the art. OA: Bassani wrote stories and relatively short novels, yet he created dense, detailed, textured worlds grounded in place and time—in Ferrara and its environs and, largely, in the political climate leading up to the Holocaust. His worlds feel whole, almost as if he’s trying to regain or remake them (as I see he discusses in the book’s final essay). A reader can experience this richness, not just in the content of the narratives, but also in Bassani’s long, digressive sentences. The sentences, in a way, mirror the larger movements of the narratives. What discoveries did you make as you grappled with translating Bassani’s profuse worlds? JM: Although you’re right that his world (singular, I’d prefer!) is very specifically located geographically and temporarily, it’s still also our world. Racism and exclusion and cruelty, recurrent themes in The Novel, are very much present and pressing for our own age, and perhaps foreign readers as well as Italians can find even more of permanent value than did his contemporaries who may well have been reluctant to confront this unflinching and harrowing portrayal of what actually happened. For Bassani what is past never vanishes, but remains, only it needs immense patience, skill, and cunning to retrieve it. It’s an ambition he acknowledges in the concluding essay, and for which he finds the image of a vanishing point at the end of a long corridor. Your observation that he attempts to ‘regain and remake’ lost time—and space—is absolutely pertinent, I think, as is your insight about his often long, digressive sentences. That’s a marked, stylistic feature from the outset—long sentences with parentheses—which have the uncanny result of slowing up time, as if to avert the impending catastrophe. Bassani’s sentences and overall pacing have analogous effects to line-endings and caesurae in poetry, and it’s worth remembering that Bassani began (and continued) as a poet. Of course there’s the danger of giving too much symbolic importance to what may only be a temperamental stylistic feature, but it’s significant that the final novel, The Heron, set after the war, has a much more staccato rhythm and far shorter sentences. We experience time in The Heron in a very different fashion to the others—it’s one of the triumphs of that novel—so your point about the way his syntax is linked to a restoration of the past seems to me a valid one. OA: What have you found most challenging about translating Bassani’s work? What specific problems of translation did you encounter working on the books that comprise The Novel of Ferrara and how did you solve them? Were there concepts or uses of language that you found you couldn’t translate? Words in dialect (and occasionally other languages). Dialect is another language but is generally easier for an Italian to guess than for an English speaker. Sometimes when the dialect adds little, I resolve the problem by translating, other times by footnoting. Bassani’s originals are (sparingly) multilingual, as is the Jewish community he belonged to, and I believe it would be wrong to efface this element. Cultural references—quotations from poems, etc. With lines of poems, I prefer to leave them in the original and footnote. It’s not that they can’t be translated, but it’s a loss. In this edition, I’ve added glosses for Latin but not French. Once there was a concealed reference to a line in Dante, which I’ve translated and merely added “quoting Dante” in the text, but generally I prefer to leave the reference intact. Political organizations or events. Here again, I’ve chosen to use footnotes where the information is much less available to an English reader—Fascist student organizations, various lesser-known political figures, etc. Bassani is very skillful at introducing just sufficient context to allow the reader to infer the history or politics, so I’ve been able to keep the footnotes to a minimum. If your question was more extensive, I’d say that finding an adequate equivalent for Bassani’s style was a constant challenge. Italian, with its agreements and connectives, is more hospitable to long sentences than English (though we have Henry James and William Faulkner and others) so that was one obviously testing element of the style, but the precision and breadth of his language, as well his range of tones from acerbic irony to emotional candor, were just as exacting. OA: The Novel of Ferrara closes with an essay, “Down There, at the End of the Corridor,” in which Bassani describes the difficulties he had in writing. He emphasizes a juncture—after he wrote Within the Walls and the first three chapters of The Gold-Rimmed Spectacles—when he felt he wouldn’t be able to discover, or receive, anything new if he continued to tell others’ stories and keep himself “hidden” in his fiction. He writes, “[F]rom now on, on the stage of my little provincial theatre it was myself that I would have to find a place for, one that was the right size and not of secondary importance. The spotlights, from then on, were also on me, whether writing or not, on all of me.” As a reader, I can feel this shift in The Gold-Rimmed Spectacles, as the narrator becomes a central participant in the story, and certainly in the immediacy of The Garden of the Finzi-Continis and on through the rest of The Novel of Ferrara. Working intimately with Bassani’s texts, how did you experience the change he describes? What other aspects of his evolution as a writer did you encounter? JM: Bassani’s initial reluctance to place himself centre-stage may well come from an intuition similar to Pascal’s “Le moi est haïssable" but, I believe rightly, at this crucial juncture of his first short novel, The Gold-Rimmed Spectacles, he saw the need for a first-person stand-in, a witness to the events, who was partial, involved and ‘implicated’ in its original sense, rather than the omniscient narrator who had served well hitherto. From then on, for that story and the two subsequent novels, the unnamed narrator, close in many respects to the author, would be his mouthpiece. In subsequent stories, we encounter some first-person narrators that we assume to be the same as in those novels, but also the extensive use of free indirect speech, or third-person narrators, as in the later resumption of the story of Bruno Lattes, who might be considered another, but distinct, authorial alter-ego. In The Heron, for example, the story is told in the third person, but the narrator is extremely close up to the tormented consciousness of Edgardo the protagonist, and has access to every twist and turn of his physical and psychological ill-being. All of this is to say that Bassani had at his disposal the full panoply of novelistic devices and made purposeful use of them all. OA: Bassani’s narratives are suffused with the political reality of 1930s and ’40s Ferrara, particularly as pressure increases on the city’s Jewish community. How did you prepare, or conduct research, in order to translate the period’s political developments as they play out in Bassani’s stories and in the lives of his characters? JM: I’m afraid the honest reply is that I didn’t (prepare or research). I already knew Bassani’s work as a poet and novelist. I had read other Italian Jewish writers of the time and earlier such as Italo Svevo, Primo Levi, Carlo Levi, Natalia Ginzburg, and also knew the work of poets that were formative for him such as Eugenio Montale, Umberto Saba, and Giuseppe Ungaretti, and in a way formative for me as well. Everything else I was able to pick up along the way, for, without being at all didactic, Bassani is a great writer to learn from. OA: The city of Ferrara is a character all through Bassani’s work. Have you spent significant time there, and if so, how did your experience of the place today impact the way you approached Bassani’s texts as a translator? JM: When I translated The Garden of the Finzi-Continis and The Gold-Rimmed Spectacles, I had still not been to Ferrara. That culpable omission made the translation more problematic with regard to, say, the recurrent presence of the city walls. The fact that on top of the walls there’s a wide avenue bordered by magnificent trees, which circles more or less the whole city for some nine kilometers, took me a while to figure out, as did his metonymic use of the plurals ‘bastioni’ and ‘baluardi’ as variant expressions for ‘le mura’. Before confronting Within the Walls, however, I had already spent some time in Ferrara, had got to know the city, the ghetto area, the Castle, the main streets, and so on. Bassani’s descriptions, however, are so finely attuned to space and topography that, even without visiting, the reader can have an astonishingly accurate image of the city itself. One of his most virtuosic descriptions is of the Temple in Via Mazzini, and though that still exists it is no longer as it was, no longer including on two floors the German and the Italian synagogues, so his description is a poignant reminder of its former glory. Other architectural features like the Castle or streets such as Corso Ercole I d’Este, “straight as a sword”, are exactly as Bassani describes them, and the character of the whole city is still miraculously preserved (thanks to traffic being prohibited in the center) and as full of bicycles as it was in his day. OA: In your view, where does The Novel of Ferrara belong in the world’s literature? JM: I wouldn’t want to fashion a canon for other readers, but for me The Novel of Ferrara is one of the greatest prose works of post-war Italy, a culture that can boast of a fair number of masterpieces by writers such as Italo Svevo, Italo Calvino, Carlo Emilio Gadda, Elsa Morante, Dino Buzzati, Anna Maria Ortese, among others, and I believe Bassani stands eminent among the best of them. Comparisons may be odious, but to indulge in one outside of Italy itself, I very much prefer his The Garden of the Finzi-Continis to Evelyn Waugh’s Brideshead Revisited, a novel it superficially resembles. Its sense of history is far deeper and I find the love story at its heart more poignant. Though very different in style, I think The Novel of Ferrara can be happily set beside Robert Musil’s The Man without Qualities and not suffer from the comparison, high praise indeed. OA: Is there anything else you’d like to add about your work on this formidable book? JM: I’d like to finish with what might be an obvious comment. Because each of the six books was composed and published separately, they can be read both as free-standing works and as a continuous, though not strictly chronological, narrative. I can think of no other major work that so effectively and satisfyingly accomplishes this dual effect. Jamie McKendrick has published seven collections of poetry and two Selected Poems. His most recent books of poems are Out There, winner of the Hawthornden prize, and Anomaly. He edited The Faber Book of 20th-Century Italian Poems (2004) and has translated the entire Novel of Ferrara by Giorgio Bassani. Among his other translations are Valerio Magrelli’s poems, The Embrace and Antonella Anedda’s poems, Archipelago. He writes reviews of literature and art.